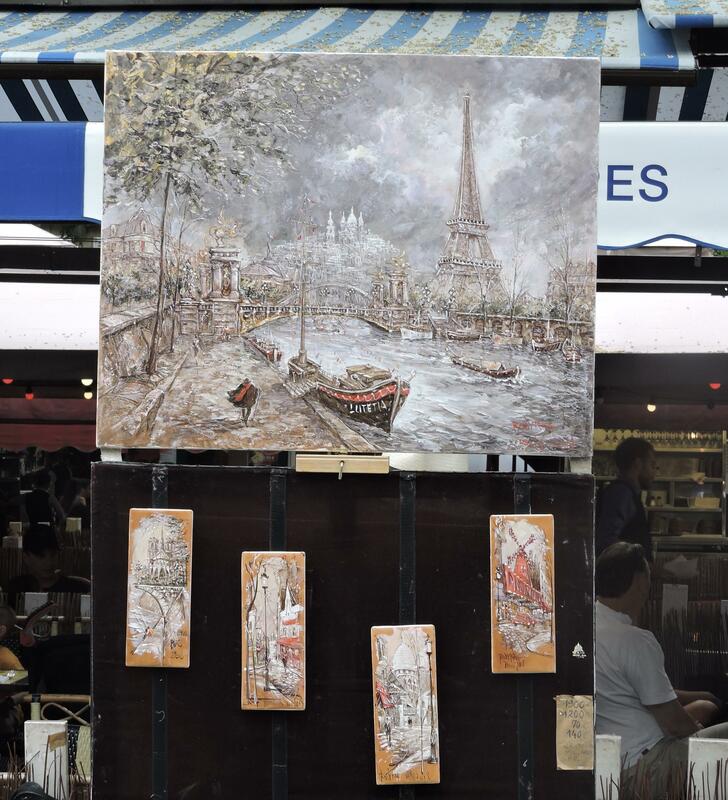 KLCC Arts Correspondent Sandy Brown Jensen Considers street art at the Montmartre Artisit’s Market. The square is swirling with color and movements as visitors mill about the over 300 artists who have their easels set up and are actively painting or talking. The smell of oil paint mixes with good smells from food carts. 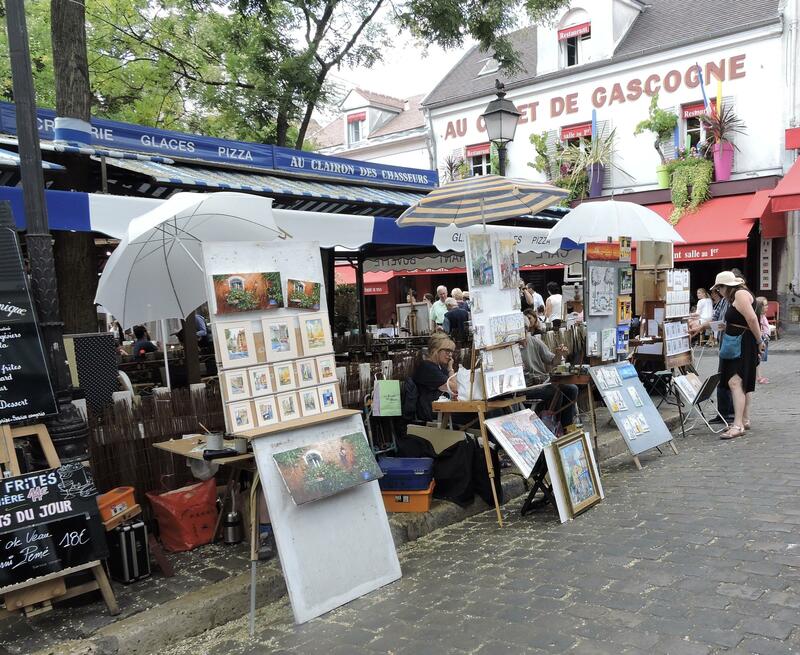 Street art at the Montmartre Artist’s Market is almost all limiited to Parisian street scene such as this one. As I walk around, I see all the artists are doing variations of familiar Paris scenes. These sell as mementos for tourists— Street art. But the term “street art” should not be said with a sneer. All 300 artists are licensed by the City of Paris after they have proved artistic ability, and there is a 10 year waiting list for new artists to set up an easel here. Most artists have one square meter to set up their easel, and they rotate shifts with other artists. All artwork must be original and painted by the resident artist—no reproductions or dealing of other art. So, yes, it’s street art, and it’s the real deal. Rates differ, but I bought four 9 x 12 inch paintings for $50 each. 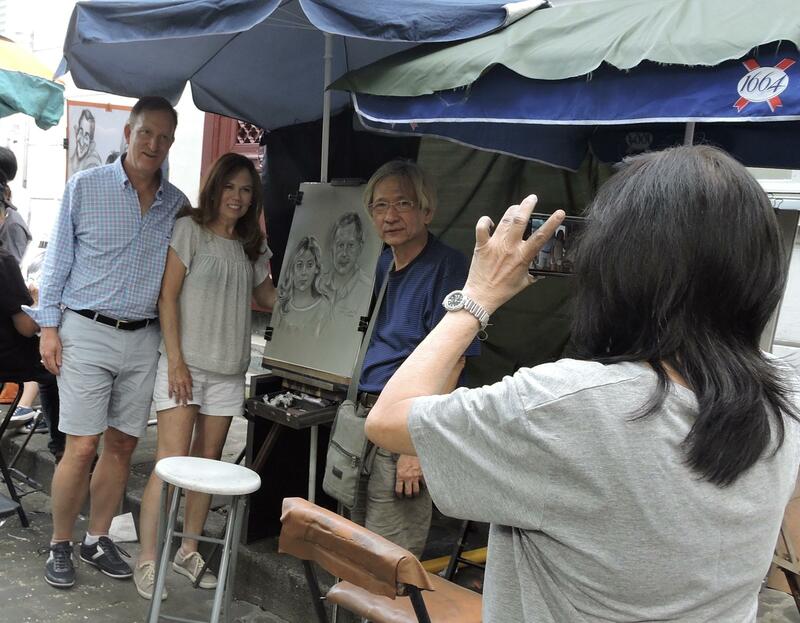 A couple who had their portraits drawn by a street artist pose for a photo of themselves with the artist. This is all in the name of mamory making, which is so important for travelers who may never come this way again. So when you visit Paris, don’t be afraid to buy street art that catches your eye and help support the hard-painting street artists of Montmartre. Besides the art market, Renoir’s home is now a museum. And I definitely get an art tourist’s thrill of visiting the place on the hill that inspired Picasso, Degas, Matisse, Toulouse-Lautrec and so many others who have painted their way into the hearts of art lovers everywhere. 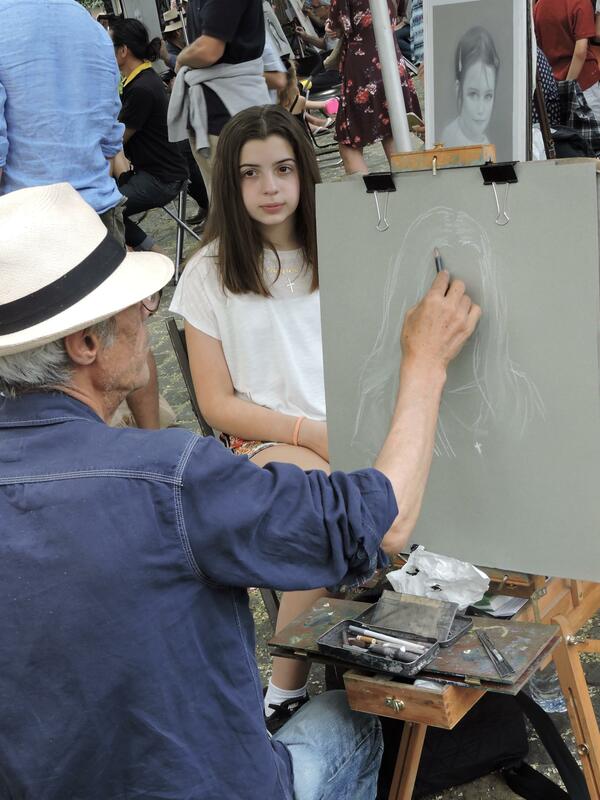 A young girl poses for her portrait by a street artiist in Montmartre Artist’s Market.